Frontier City, Oklahoma City, Oklahoma, has opened for its 61st season. 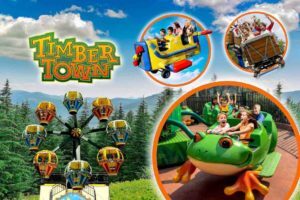 Debuting for children will be four new attractions, new theming, and updates in the park’s new woodsy-themed kids area, Timber Town. The new rides, all from Zamperla, include Billy’s Frog Hopper (Jump Around), Sheldon’s Balloon Race (Balloon Ferris Wheel), Rocky’s Ranger Planes (Buzzed Jets), and Frankie’s Mine Train (Gravity Coaster). Guests can soar high above the frontier on Oklahoma’s only suspended coaster, The Steel Lasso, or cool off and make a splash in Frontier City’s popular Wild West Water Works where the slides feature back-to-back turns, thrilling dips and 360° curves.